We love having personal ways to tell family that we love them. 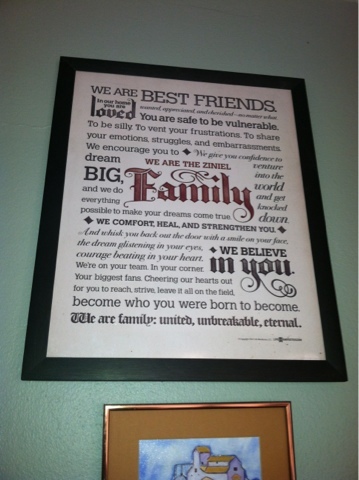 Reviewing this beautiful personalized Family Manifesto from Life Manifestos is amazing! "We are best friends. In our home you are loved, wanted, appreciated, and cherished no matter what. You are safe to be vulnerable. To be silly. To vent your frustrations. To share your emotions, struggles, and embarrassments. We encourage you to dream big, and we do everything possible to make your dreams come true. We give you confidence to venture into the world and get knocked down. Come back to us. We comfort, heal, and strengthen you. And whisk you back out the door with a smile on your face, the dream glistening in your eyes, courage beating in your heart. We believe in you. We're on your team. In your corner. Your biggest fans. Cheering our hearts out for you to reach, strive, leave it all on the field, become who you were born to become. We are family: united, unbreakable, eternal." I love that it reminds my children that they are loved, no matter what. My favorite line is, "We encourage you to dream big." Want to win your OWN personalized Family Manifesto? Enter Below! i like the last part ...We are family: united, unbreakable, eternal. my fave line is We encourage you to dream big, and we do everything possible to make your dreams come true. "In our home you are loved, wanted, appreciated, and cherished no matter what." my favorite part is In our home you are loved, wanted, appreciated, and cherished no matter what. We comfort, heal and strength you--that is so awesome! We give you confidence to venture into the world and get knocked down. Come back to us. We encourage you to dream big, and we do everything possible to make your dreams come true. I love all of them. Very inspirational. I love "We believe in You"
I love the Family being the big, color word, It looks beautiful!!! I love all of the positive statements. We encourage you to dream big, and we do everything possible to make your dreams come true. First and last lines...we are best friends, we are family, united unbreakable, eternal....thank you for the chance to win. We believe in you. We're on your team. In your corner. I love the phrase: "We encourage you to dream big" Thanks for the giveaway! I would like this part: Cheering our hearts out for you to reach, strive, leave it all on the field, become who you were born to become. I love that the owner wanted his kids to read these things to inspire them to what really matters in life.